When the Tempest twins, Louisa and Lavinia, come to London, it is Lavinia who has the highest hopes of making an eligible marriage. Aware that her propensity for creating awkward situations may be a handicap, Lavinia is nevertheless unprepared for the results of a literal fall on the dance floor at Almack’s. The fall, which ultimately involves not only Lavinia but also a formidable number of London’s elite, is a disaster of such proportions that not all Lavinia’s careful rule abiding can overcome it. And then there is her mother’s transgression, an old scandal that has more lives than Louisa’s cat. Alaster “Tuck” Rowland understands the effects of scandal. He is aware of the accusations of cowardice that circulate around him since he failed to fight in the Napoleonic War in which one of his closest friends perished and another was severely wounded. In fact, it was seeing the latter engaged in physical conflict with a villain that leads Tuck to abandon Lavinia on the dance floor, thus causing the fiasco. Tuck was too inebriated at the time to realize the consequences of his action, but he belatedly recognizes his unwitting role in Lavinia’s downfall (pun intended). That recognition along with a vague sense that he owes a degree of loyalty to the Tempest sisters because they are the goddaughters of his uncle adds impetus to his determination to win his wager that he can turn them into the brightest diamonds of the season. But as Tuck and Lavinia spend time together, his reasons become deeply personal, and her concern for proper behavior is overcome by her feelings for the most improper Tuck. 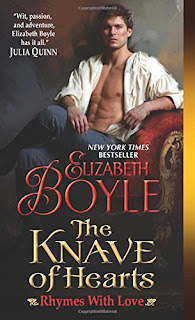 The Knave of Hearts is the fifth book in Boyle’s Rhymes with Love series. It is not necessary to have read the full series to enjoy Tuck and Lavinia’s story, I do recommend reading the fourth book, The Viscount Who Lived Down the Lane, because it is Louisa Tempest’s story and the sisters’ stories run parallel to one another. Boyle has a knack for writing light books that are fun to read without leaving the reader feeling as if she has indulged in too many marshmallows. Tuck and Lavinia are likeable and amusing, and, despite the title, Tuck’s knavery is in a minor key. Although the danger the two face is real enough, the reader is never in doubt that this pair will find their way to a satisfying HEA. The sisterly exchanges are a plus and as much a part of the book’s success as is the banter between the romantic leads. If you like your romance mixed with humor, I suggest you add The Knave of Hearts to your list. Sounds like a great read - thanks. I have been wanting to try this series. Humor is an important element for me in the stories I read. I like the sound of this story. Thank you for the review.